‘ Lucy Coats’ remarkable book, Cleo…is a unique and colourful look into the turbulent path that led [Cleopatra] to achieve her place in history.’ Dawn Finch, vice-president of CILIP in Awfully Big Reviews. Cleo is my first foray into fiction in the magical place where history meets mythology, and is the first of two YA novels for teenage readers. Cleo’s precious mother is dead – and it isn’t an accident! The Pharaoh’s illegitimate daughter must flee the royal palace at Alexandria or be killed too. As her evil half-sisters finally usurp the throne, Cleo finds sanctuary within the sacred temple of Isis, where four years later she becomes initiated into the top-secret Sisters of the Living Knot. But now Isis’s power is failing, Egypt itself is in danger, and the teenage Cleo must prove her loyalty to her goddess by returning to the Alexandria she hates. Her task is to seek out the hidden map which is the key to returning Isis’s power – on pain of death. But will she be able to evade her horrible sisters and sneak into the secret archives of the Brotherhood of Embalmers? And will she rediscover dreamy Khai, the über-hot Librarian boy she met as she fled Alexandria years before? Cleo’s powerful destiny is about to unfold…. 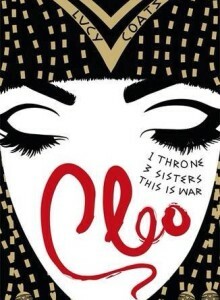 Gorgeous and evocative, Cleo imagines the life of the teenage Cleopatra before she became the icon we all think we know. Cleo was published by Orchard Books on 7th May 2015. You can see some of my ideas for characters and settings on my Egyptian Inspirations Pinterest page.